No.1 made a debut by running campaign across the country as the cheapest,safest means of protection. 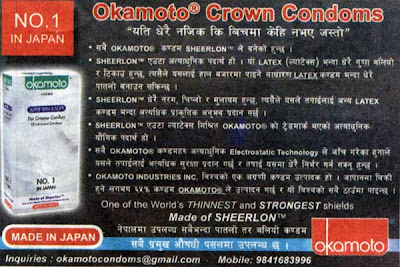 Now, there is new Condom in Town, Japanese-made,boldly claiming skinless skin for it's condoms called Okamoto Crown Condoms. I read this AD in one local daily and thought some may be interested. When i read the AD, they claim it's the condom which makes men feel they are not wearing anything, sensitizing the most pleasurable moments. Men usually deny wearing condoms because it made them feel they're not getting full sensuality. It seems this is answer for them. Looking at the width size,it's gonna be perfectly fit on normal size or even tighter which is definitely a must for any couple around planning to make love. I felt like i was not wearing it. ashish, i think it's available on major health clinic.. and within a 2 or 3, it'll be as easy as No. 1 , i guess..